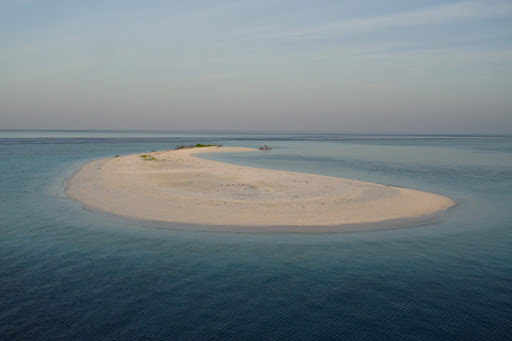 After a wonderful week in Sri Lanka we flew on to the tropical archipelago of The Maldives, a double chain of 26 atolls in the middle of the Indian Ocean. On arrival in the capital Malé we joined our guide Chas Anderson and boarded the live aboard boat Ari Queen, our home for the next 7 days. An ocean-lovers paradise of white sandy beaches and crystal clear blue waters, we spent our morning’s snorkelling amongst the colourful corals and beautiful fish of the reefs. Fish of all shapes and sizes, flashed in a brilliant array of colours among the purples, reds, pinks and blues of the coral. Occasionally we would encounter an octopus hiding amongst the crevices or a turtle gliding silently over the coral and sandy bottoms. After breakfast we would head out of the atolls for a days whale watching in the deeper waters. In a world of bright, endless blue skies and a vast vibrant blue ocean we were treated to the delights of tropical whales and dolphins…. 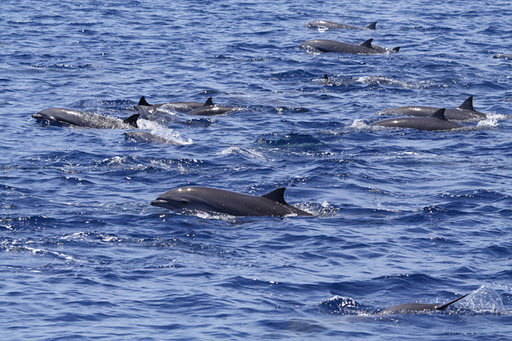 Vast pods of spinner and pantropical spotted dolphins surrounded the boat, leaping clear of the water and in the case of the spinners, spinning three, four, five even six times before landing with a tremendous splash. On a couple of occasions we encountered these dolphins with seabirds and yellowfin tuna, with the tuna breaching almost as much as the dolphins! 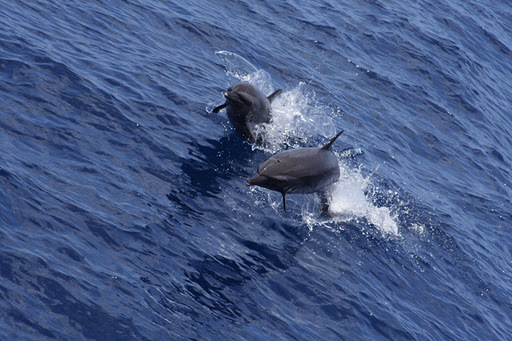 On two occasions we encountered groups of Fraser’s dolphin, a species thought extinct until 1971! 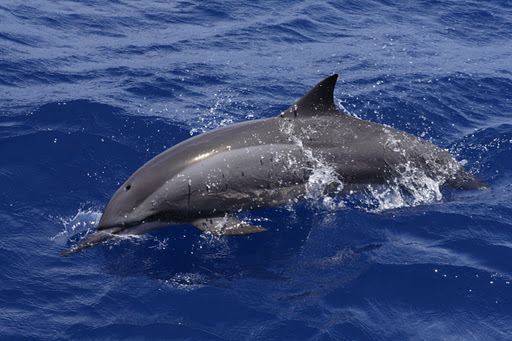 A beautiful dolphin, often flushed pink on the belly due to the warm waters, they travel in very distinct, tightly packed groups making the surface of the ocean boil. We encountered five separate pods of short-finned pilot whales, with one extremely memorable occasion where two whales surfacing leisurely alongside the boat, so close you could see the whole length of the whales under the water. Other species we encountered included striped dolphins, bottlenose and indo-pacific bottlenose dolphins and a couple of pods of Risso’s dolphins, including heavily scarred adults and almost smooth, velvety grey juveniles. After a day’s surfing around the ocean watching these stunning creatures, we would head in to anchor next to an island, and head in for another snorkel before dark. Our final day was the icing of top our whale wedding cake, the morning started with a snorkel with one of the most magnificent fish I have ever seen, a manta ray. Appearing out of the blue haze, parting schools of silvery fish, the ray glided towards us, turned and disappeared, once more a mystery of the deep blue. As we headed out after breakfast we were treated to numerous sightings of dwarf sperm whale (they look like upside down surf boards!). So far the beaked whales had proved elusive, but later that day as we steamed along, we heard the sound of a whale exhale right next to the boat. Dashing to the side we saw a mother and calf Longman’s beaked whale surface right alongside! Amazing! So little is known about beaked whales in general due to their shy nature, and deep water habitat and Longman’s is one of the rarest and least known, it really was a special sight. 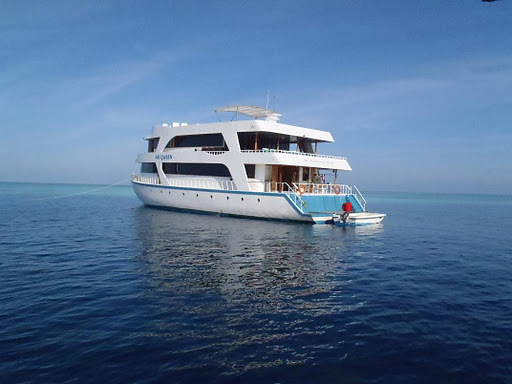 Our trip was run by Chas and Sue Anderson, who run regular trips to The Maldives and Sri Lanka, and are THE authority on whales and dolphins in these areas, not only providing superb information but collecting data and conducting invaluable research.